Your imprint will never wear off these name tags! 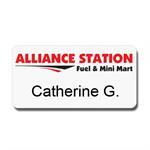 Rugged .040 vinyl name badge is extremely durable and long lasting. 28 standard imprint colors to choose from. Click here. Imprint is over-laminated. It will never fade or wear off. Easy to use. Names are applied by labeling tape or marker pen. The prices shown below are for orders of 50 badges. The more name badges you order, the lower the price! Click on each badge to see how much money you can save on larger orders! 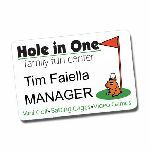 Full-Color Laminated Vinyl Name Badge: 2" x 3"
Full-Color process printing on a laminated vinyl employee name badge is the most colorful, durable name badge you can get. 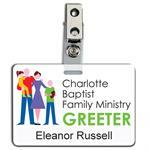 Your logo will never fade or wear off your name tag and the badges are reusable. Prices range from $6.49 to .80 ea. 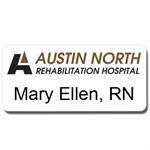 Full-Color Laminated Vinyl Name Badge: 2 1/8" x 3 3/8"
Full-Color process printing on a laminated vinyl employee name badge is the most colorful, durable name badge you can get. 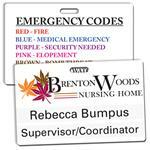 Your logo will never fade or wear off your name tag and the badges are reusable.! Prices range from $6.59 to .82 each. 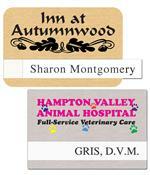 Laminated Vinyl Name Badge: 2" x 3"
Full-Color Laminated Vinyl Name Badge: 1 5/8" x 2 3/4"
Full-Color process printing on a laminated vinyl name badge is the most colorful, durable name badge you can get. 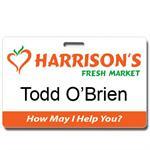 Your logo will never fade or wear off your name tag and the badges are reusable. Prices range from $6.09 to .78 each. 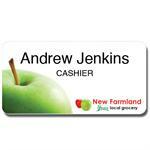 Full-Color Laminated Vinyl Name Badge: 1 3/8" x 2 3/4"
Full-Color Laminated Vinyl Name Badge: 1" x 2 3/4"
Full-Color process printing on a laminated vinyl name badge is the most colorful, durable name badge you can get. 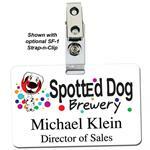 Your logo will never fade or wear off your name tag and the badges are reusable. Prices range from $5.99 to .75 each. Full Color Personalized Badge - 1 1/2" x 3"
Your logo and personalization are digitally printed on extra thick .050 plastic name badges and then overlaminated to protect the imprint. Prices range from $13.42 to $2.09 each. Includes 3 lines of personalization. Full Color Personalized Badge - 2 1/8" x 3 3/8"
Your logo and personalization are digitally printed on extra thick .050 plastic name badges and then over-laminated to protect the imprint. Prices range from $13.59 to $2.29 each. Includes 3 lines of personalization. Full Color Personalized Badge - 2" x 3"
Your logo and personalization are digitally printed on extra thick .050 plastic name badges and then overlaminated to protect the imprint. Prices range from $13.59 to $2.29 each. Includes 3 lines of personalization. Executive Window Badge - 1 1/2" x 3"
Metallic Silver or Gold Executive Window Badges are printed in full-color and then overlaminated to protect the imprint. Prices range from $16.99 to $2.89 each. Includes safety pin and insert card. Window is build into the badge! Executive Window Badge - 2" x 3"
Metallic Silver or Gold Executive Window Badges are printed in full-color and then overlaminated to protect the imprint. Prices range from $17.99 to $3.29 each. Includes safety pin and insert card. Window is build into the badge! Executive Window Badge - 1 3/4" x 3"
Metallic Silver or Gold Executive Window Badges are printed in full-color and then overlaminated to protect the imprint. Prices range from $18.29 to $3.69 each. Includes safety pin and insert card. Window is build into the badge! 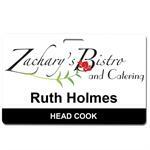 Full Color Personalized Badge - 1 1/4" x 3"
Laminated Vinyl Name Badge: 2 1/8" x 3 3/8"
Laminated Vinyl Name Badge: 1" x 2 3/4"
Laminated Vinyl Name Badge: 1 3/8" x 2 3/4"
Laminated Vinyl Name Badge: 1 3/8" x 3"
Laminated Vinyl Name Badge: 1 5/8" x 2 3/4"
Our One-Color, Double-Sided Emergency Badges allow you to use the back of your name badges to keep important rules and policies where your staff can find them. 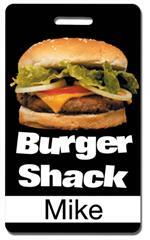 Prices range from $2.59 to .25 each. 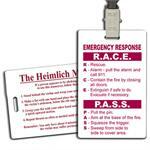 Our Full-Color, Budget Emergency Badges allow you to use the back of your name badges to keep important rules and policies where your staff can find them. Prices range from $2.79 to .27 each. Economy Full-Color Plastic Badges: 1 3/8" x 2 3/4"
Our Full-Color, Economy Name Badges are .030 plastic that is laminated to protect the imprint and comes standard with an oval hole. These budget friendly plastic employee badges are printed on one side. Prices range from $2.45 to .27 each. 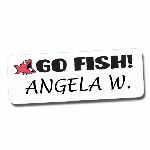 Economy Full-Color Plastic Badges: 1 5/8" x 2 3/4"
Economy Full-Color Plastic Badges: 2" x 3"
Our Full-Color, Economy Name Badges are .030 plastic that is laminated to protect the imprint and comes standard with an oval hole. These budget friendly plastic employee badges are printed on one side. Prices range from $2.49 to .28 each. Economy Full-Color Plastic Badges: 2 1/8" x 3 3/8"
Economy Full-Color Plastic Badges: 1 3/8" x 3"
Economy Full-Color Plastic Badges: 1 3/8" x 3 1/4"
Economy Full-Color Plastic Badges: 4" x 3"
Our Full-Color, Economy Name Badges are .030 plastic that is laminated to protect the imprint and comes standard with an oval hole. These budget friendly plastic employee badges are printed on one side. Prices range from $2.89 to .36 each. Laminated Vinyl Window Badge: 1 3/8" x 3"
Our Laminated Vinyl Window Name Badges are easy-to-use because you print your employee information onto printer insert sheets that get slid into the badge with a clear protective window. 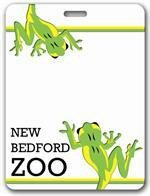 The lamination protects your logo so it will never fade or wear off! 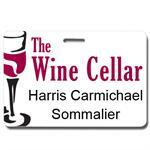 Laminated Vinyl Window Badge: 1 3/4" x 3 1/4"
Laminated Vinyl Window Badge: 2" x 3"